Here in Barnegat, we have so much to be thankful for. This newsletter will highlight the accomplishments of individual students as well as groups of students. I recognize that these accomplishments happen when wonderful things are happening in school, like teachers and coaches going the extra mile to support students partnered with parents who want the very best for their children. I hope you take as much pride as I do in the following accomplishments that continue to make Barnegat shine. additional award; Sarah placed 2nd! We are extremely impressed and proud of her! best percussion twice during the season. This season the Marching Bengals competed at Southern Regional High School where they were awarded Grand Champion for having the highest score in the entire competition. At NJ State Championships the Marching Bengals came in second place out of 49 bands in their classification and won best visual effect at Championships. They routinely came in first in second in competition and often won best visual and guard. Thanks to our hard working music, drill, percussion and guard instructors as well as the many band parents who support our music program. Music Hall in Waretown, NJ on the night of November 11th, home football game on November 22 and the Pearl Harbor remembrance service on December 3rd at the Barnegat Dock with the American Legion. It is wonderful that the Barnegat Schools continues to be part of our community with pride and respect for our country. country devoted to featuring the positive things happening in public schools. On October 29t, our very own Barnegat High School, Ms. Elko was featured. Her segment was called “Reach Before You Teach". 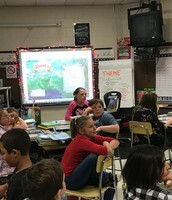 Please take a moment to view it here: http://classroomcloseup.org/segments/reach-before-you-teach/ What a wonderful impact Ms. Elko is having on our students! for their service and support of the Barnegat Township Schools. Boardwalk Hall in Atlantic City at the second annual Christmas Spectacular. They were in the company of well-known professionals. The Select Choir also performed at the Borgata with the Stockton University Choir on December 10 and were featured on WOBM on December 4th. Whether you are a parent or teacher, board member or committee member, volunteer or coach, I am grateful for your support of our amazing school district and both student and teacher accomplishments this holiday season. 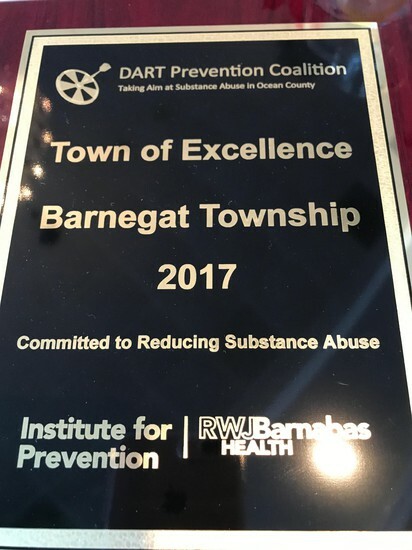 On Tuesday, December 12 the Barnegat School District and Township of Barnegat were honored by the RWJ Barnabas Health Institute for Prevention’s DART Prevention Coalition. This year the only town in Ocean County receiving the Township of Excellence Award was Barnegat. Two years ago, the Barnegat School District lost important funding previously provided by the Township’s Municipal Alliance. These necessary funds assisted with Project Graduation, the mentor-mentee program, and other prevention programs provided for nearly 3200 students who attend Barnegat Schools. 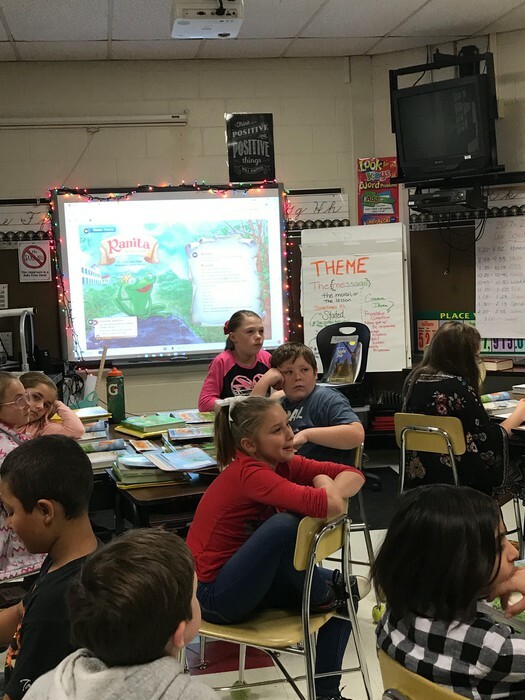 In an effort to retain these important programs, the Barnegat School District has aggressively sought other funding sources. In July, the Prevention and Wellness Coalition of Barnegat was founded by Superintendent, Karen Wood. The school district will be applying for a Drug Free Communities grant in the spring. Generally issued to townships, the school district sought support from RWJ Barnabas Health to begin preparing for grant submission. In order to qualify for the grant, twelve sectors must collaborate. Some of those sectors include the school district, municipality, local business, health care provider, faith based organizations and civic organizations. “I knew we had to act fast”, Wood stated. “We had to get in touch with representatives from all sectors, and begin meeting.” The grant application calls for a minimum number of meetings with agenda, minutes, surveys, and data collected from the community and school district in order to apply for the Drug Free Communities grant. Sectors represented on the Prevention and Wellness Coalition of Barnegat are the Barnegat Township School District, the Barnegat Recreation Department, the Barnegat Township Committee, the Barnegat Police Department, the Mirage Adult Community, the Heritage Adult Community, the Jersey Shore Girl Scouts, the Boy Scouts, Oasis Family Center, Barnegat Rotary Club, Barnegat Neighborhood Watch, Hearts of Mercy, Local Business Owner/Parent representative (Lefty’s), Barnabas Health, and Rutgers University. Superintendent Wood is thrilled with the local support received in this important endeavor. Manager, Michael Kapko of the DART Prevention Coalition said, "The commitment from the school district is absolutely phenomenal. I cannot say enough about the schools and the people we've had the chance to work with, not just in the past year but in years leading up to this as well." The Holidays are an exciting time for many students but many families face challenges like finding affordable day care, camps, or activities to keep their children busy while they work. The article below may give you some ideas on how to navigate during Winter Recess, keep your children engaged and start 2018 refreshed! Many parents, especially working parents, dread the school holidays but, with a little careful management, they can become a much easier time. Discover how. I wanted to take a moment to wish all of our Barnegat Schools Families a very Happy Holiday season and a wonderful New Year. Please do not forget that Friday, December 22 is an early dismissal day for all schools. My wish for all of you is for health and happiness in the New Year. Here in our six schools, our goals remain the same - to provide a nurturing environment where students can reach their highest potential. For some students that means excelling in academics, while for others it's athletically, socially, or through the arts. Thank you for continuing to support our schools. Wishing you a joyous Holiday Season and a very Happy New Year. Students remain engaged and excited as we approach our Winter Recess! Have you filled someone's bucket today? If not, the day isn't over yet. 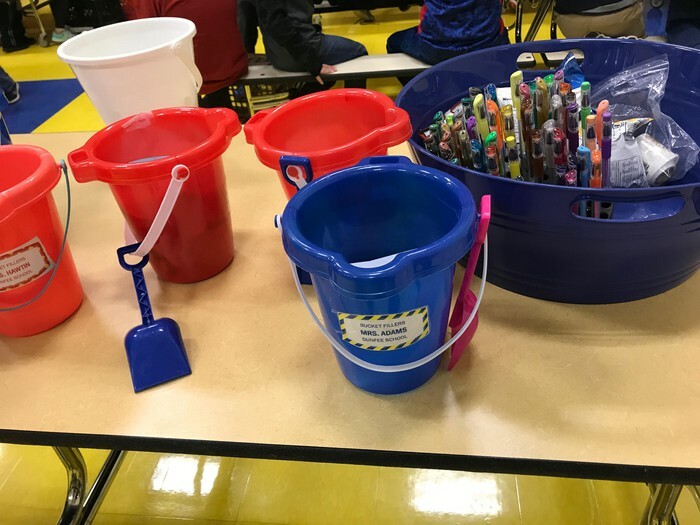 The students from LMDS practice bucket filling. For their nomination, a lucky student receives a reward. Great job, LMDS! Even our very littlest hands are in the Holiday Spirit! 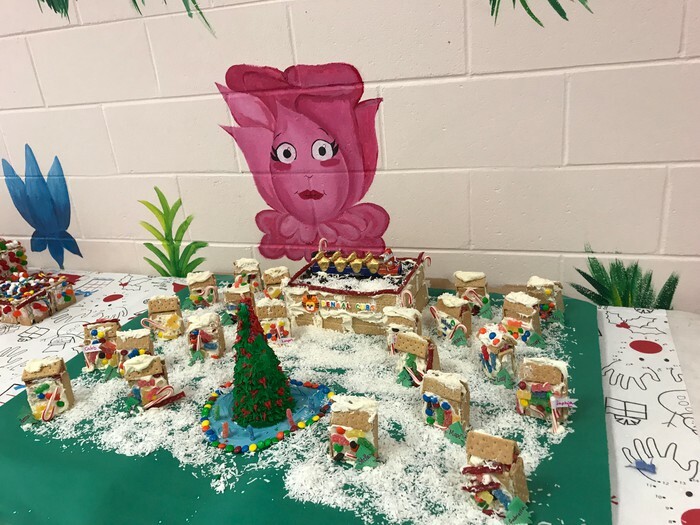 Check out their gingerbread houses. Great job, Cubs!